Thrive’s organizational structure is designed to ensure all levels of leadership responsibility are connected to its communication network. To ensure that Thrive’s board remains accountable to the community served, its members are appointed by steering committee composed of the board chair and executive officer from each of the four founding organizations ─ Sioux Empire United Way, Sioux Falls Area Chamber of Commerce, Sioux Falls Development Foundation, and Sioux Falls Area Community Foundation. Thrive’s governing board and staff are responsible for advancing its mission – to make sure all children in the Sioux Falls area have the resources they need to thrive and achieve their highest educational and career potential. The board relies on a 15-member strategy council that assesses community resources, identifies obstacles to student success, and recommends research and action priorities. Thrive action teams are volunteers drawn from government, business, nonprofit and faith sectors. A-teams use a collective impact model and continuous quality improvement tools to create efficient systems out of the many programs and services that support children and families in need. Their work is informed by Augustana Research Institute. The Sioux Falls area is blessed with dozens of community groups and social service agencies that are working to improve student success. 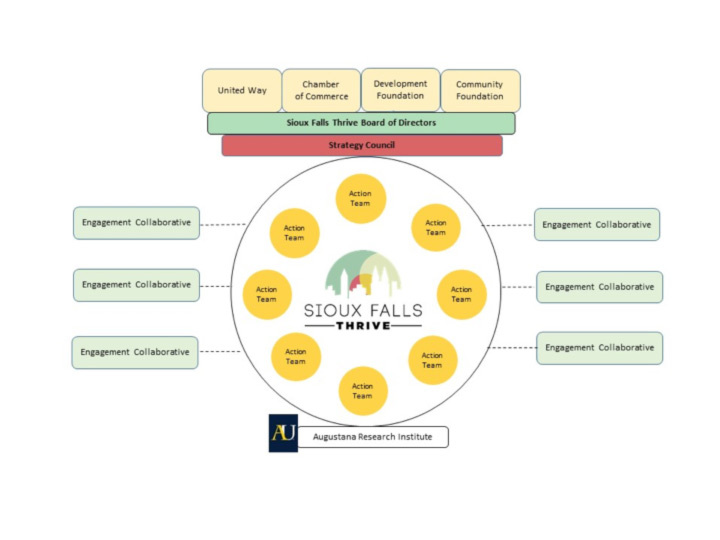 Groups that wish to align their efforts with Thrive’s collective impact initiatives are known as engagement collaboratives. Thrive is grateful for the vision and support of its sponsors.